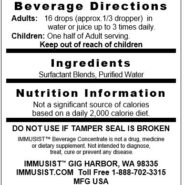 IMMUSIST™ is a Beverage Concentrate of formulated surfactant blends that lower surface tension while hydrating and oxygenating cells reducing inflammation. The human body cannot live without surfactants. At about six months into gestation and throughout one’s life, the body produces surfactants. Sickness, disease and pain can compromise this process.